The bedroom is your sanctuary. This is the room that you come to at the end of a long hard day. This is the room where you go to find peace, relaxation and healing. Carefully planning the design of your bedroom will help you make sure everything is just right. Whether you’re remodeling or planning a custom home build, keep these 7 bedroom essentials in mind. The bed is the centerpiece of this room. When outfitting your space, don’t simply place a mattress and box spring in the center. A pillow top, adjustable bed, or memory foam mattress are some options you can consider to provide the perfect amount of comfort. The frame that you choose should speak to your personality. For a zen-like atmosphere opt for something low to the ground. If you’d like an air of opulence, a four poster or sleigh bed may be just the thing. For a spa feel, a tufted velvet or leather headboard will give the appearance of a high end hotel. Dress your bed well. Invest in high thread count, organic cotton sheets. A down comforter keeps you warm. Wool or chenille blankets add texture, color, and make the space a bit more cozy. A bedroom is not only for sleeping. Since this is your place to get away, furnish this room with a great place to sit. A love seat or club chair tucked into the corner provides a cozy place to relax. This may be your new favorite spot for reading, or to enjoy your morning coffee. Click here to see more of this featured remodel. Your bedroom is where you get ready to face the world on a daily basis, so a stylish place for your clothing is essential. A tall or wide dresser is the perfect place for delicates, socks, shirts, and casual clothing. A walk-in closet provides further storage space for dresses, suits, pants and shoes. Giving yourself a stylish home for your clothes can help you put your best foot forward. The bedroom is all about texture. When you hop out of bed in the morning, let it be onto something soft and soothing. A plush rug adds texture and can gives you the opportunity to add some color into the room as well. Unless you have a view of the ocean, you’ll want to be able to close your windows at night for privacy and to shut out any light. Window treatments tend to change with the seasons. In the warmer months, opt for linen or sheer drapes for a light and airy feel. In the winter, velvet and silk make for more luxe window treatments. In the bedroom, lighting can help you wake up in the morning and help you relax at the end of the day. Many designers say that you should have three points of light to complete the space. Bright lights should be in the dressing area. Soft lighting should frame the bed to set the mood at the end of the day. A standing lamp may be the third source, for reading in your sitting area. Whether you like a large abstract print hanging over the bed or lots of small framed family pictures, art will complete your space. Make sure these are images that make you smile as they will help you set the tone at the beginning of the day, and are the last thing you see at night. Do you need to spice up your personal space? 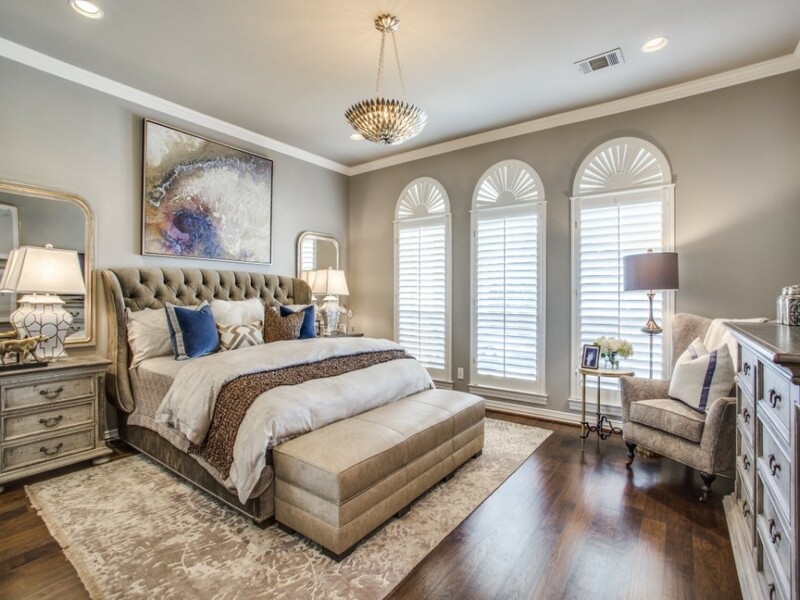 Start planning a bedroom remodel today with the help of our design team.